Goodfellas Movie Poster 27 x 40. 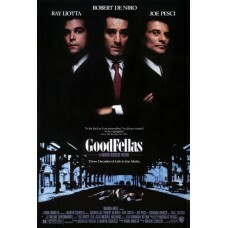 Goodfellas (styled as GoodFellas) is a 1990 American crime film directed by Martin Scorsese. It is a film adaptation of the 1986 non-fiction book Wiseguy by Nicholas Pileggi, who co-wrote the screenplay with Scorsese. The film narrates the rise and fall of Lucchese crime family associate Henry Hill (the first-person narrator in the film) and his friends over a period from 1955 to 1980.